Edith Baumgartner manages the Graz office of Iventa Management Consulting GmbH. She supports clients successfully in national and international searches and placement of top management and specialist positions. 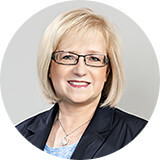 After graduating with a degree in history and German studies, Ms. Baumgartner spent a few years in adult education before taking over management of the Graz office of a human resources consulting agency in 1994, and therefore lookson over 20 years of work experience in HR consulting.